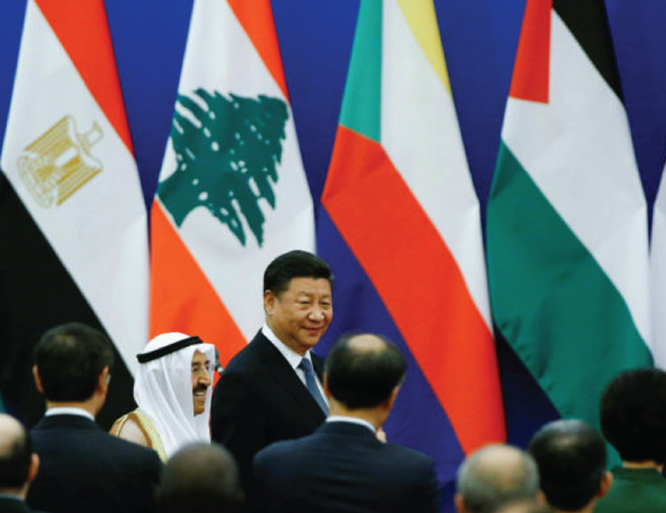 Chinese President Xi Jinping pledged on Tuesday $105m in aid to Palestine, Yemen, Syria and Jordan in a speech at the China-Arab States Cooperation Forum (CASCF) in Beijing. The Chinese government will hand $90m to Yemen, Syria and Jordan, Xi said, with another $15m earmarked for Palestine. The financial assistance for Palestine will target economic development programmes and aim to improve living standards, he said. It will also include donations to the United Nations Relief and Works Agency for Palestine (UNRWA). Xi added that China plans to hold an international conference on Palestine to support efforts to reach a durable two-state solution based on the 2002 Arab Peace Initiative, in which Arab countries pledged to normalise relations with Israel in return for securing a Palestinian state to certain specifications. Twenty Arab foreign ministers attended Tuesday’s event, which is the eighth ministerial meeting for the CASCF since 2004. The forum seeks to enhance Chinese-Arab trade relations, and has boosted the bilateral trade volume from $37bn in 2004 to $191bn in 2017, according to the Chinese news agency Xinhua. China has become the Arab world’s second-largest trading partner, Xinhua reported. In statements to Xinhua on the eve of the meeting, Palestinian Foreign Minister Riyadh al-Maliki said the meeting “opens the way for further trade and non-traditional aspects of the Chinese-Arab relations”. The Belt and Road Initiative is a development strategy announced by the Chinese government in 2013 aiming to boost Chinese trade ties with Asia and beyond by building a trade and infrastructure network connecting Asia with Europe and Africa, along the ancient routes of the Silk Road. Maliki expressed his hopes that Palestine would play an important role in China’s Belt and Road Initiative, “becoming the hub which links Africa and Europe”. A Palestinian delegation led by Palestine Liberation Organisation member Ahmed Majdalani visited China in December 2017 in a bid to find “an honest broker” for the Arab-Israeli peace process after the United States’ recognised Jerusalem as the capital of Israel. In the same month, China signed a memorandum of understanding with Palestine to conduct a feasibility study on a free-trade zone agreement between the two countries, according to Reuters. Secretary-general of the Arab League, Ahmed Abul Gheit, said in his opening remarks at the CASCF that China and Arab countries have launched 15 mechanisms of cooperation since 2004 as part of the forum. He announced that a “Sino-Arab digital library” would be launched on Tuesday as well as an Arab declaration on the Belt and Road initiative. Abul Gheit said the Arab world welcomes Chinese support for the Palestinian cause and the struggle to establish an independent Palestinian state on the pre-1967 borders.